Even though I’m a big chocolate fan, I tend to dislike candy bars. They’re just not chocolaty enough for me, too sweet, never worth the calories. The one exception used to be (pre-soy allergy) almond joy bars. In stereotypical food blogger fashion, I decided instead to make my own coconut-cocoa almond butter. We live in the Pinterest era. DIY or bust. I started this recipe with slivered raw almonds, which were somehow cheaper than whole raw almonds. Beginning with slivered almonds also means your blender has to do less work, thus reducing the risk of blender burnout. And the maple syrup supplies a wonderful blade lubricant without adding extra oil. I will conceded that the added maple makes it somewhat less healthy than regular almond butters. On the other hand, it is a protein rich snack that’s perfect to satisfy a chocolate craving. This is a wonderful back to school recipe because it’s so quick and easy. And if you don’t have kids (or your kids hate coconut, gah, why) you should make it for yourself anyways. It’s a candy bar in a jar, which is pretty much the cat’s pajamas. Because of the maple syrup, this will become a coarse butter quickly, but it will take about 8 minutes to smooth out. Remember to give your food processor/blender a break every few minutes so that it doesn't overheat. Grind the almonds down to a coarse meal. Add the coconut and grind again. Add the cocoa powder and maple syrup. Process until it becomes a paste. We went to dinner at the in-laws’ a few nights ago and the kids (my niece and nephew) broke out the chocolate milk. It looked so sweet and cool and tempting an pretty soon the ankle-biters weren’t the only ones drinking it. Don’t you miss the days when you could have chocolate milk next to your broccoli and mashed potatoes? I very much wanted some, but couldn’t have any. Many chocolate milk mixes contain soy, and I’d already gotten a few allergy attacks from eating leftover Christmas candy. I knew shouldn’t have it, but I eat it anyways and then I pay. I needed to get my soy-sneezes back under control. That chocolate milk looked so good, but luckily there was some wine there to distract me. A few days after that, I was restocking Jason’s snack cupboard an a tin of Carlos V milk mix fell out onto the counter. Tempted again! Speaking of his snack cupboard, can I just go on a little tangent for a sec? He likes to mix chocolate power and protein powder into milk for his breakfast and it rather grosses me out. It gets gloppy and lumpy and the powder never fully dissolves into the milk. I don’t know if this is actually gross, or I just think of it as gross. But I can’t be in the room when he makes his breakfast. Maybe it’s that he puts protein powder into milk, which I dunno, I imagine would feel like a rock in your stomach. Aren’t you supposed to put protein powder into water? Am I crazy? Why are so many of the paragraphs in this post ending in questions? Are you tired of hearing my talk about Jason’s weekday breakfast habits? Let’s talk about leche instead! I recipe tested this a over a few nights, mixing individual glasses here and there to get the ratios right. Testing chocolate milk….whew…hard work. So..you’ll notice that there’s quite a bit of powdered sugar in the recipe. Whoops? Yes, it tastes more sweet than chocolaty, but I have a firm belief that that is how cold chocolate milk should taste. A little trashy, a little nostalgic, and a lot comforting. Stir together the powdered sugar, cocoa powder, and salt. Add the water, stirring until there are no pockets of dry powder. add 1-2 tbsp of syrup to 8 oz milk. serve with love. Store syrup in the fridge. Do not dip the milk-stirring spoon back into the syrup. But first, how were y’all’s Thanksgivings? Mine was wonderful. I worked in the morning, where I witnessed so much goodwill that I was literally jumping for joy (traditional sense of literal). It put me in a good mood right then and there. I thought I was going to be wiped out by the time I got off, but everybody’s kindness must of energized me. I went home and changed and didn’t even need a nap before heading over to dinner. As I mentioned in one of my earlier posts, large gatherings make me nervous. But for some reason, I was fine almost the whole time. I got there late, so everyone had already eaten and where heading out for a walk. That was really nice, too. I feel like in my family, everyone would have waited for me to get there. Then they would have laid on major guilt about making everyone wait. Since everyone had eaten, there was no awkward “you go first no you go first” line and I just scooped up leftovers here and there, taking as much as I pleased. Mainly I ate cheesy potatoes and Brussels sprouts. Jason’s aunt makes some really good cheesy potatoes. I might try to steal her recipe, but add jalapenos or something. *this does not mean I’m ready to have one of my own. So. I love my family, but Thanksgiving with Jason’s kin pretty much won over every Thanksgiving I had with my own folks. Also, Jason’s family uses paper plates, which meant FEWER DISHES. Okay, okay, enough about the holiday. Let’s talk about the cheery forest. I wanted to call it a magical little forest, that reminds me of bad paperbacks from the discount bin. But these trees really are magical. 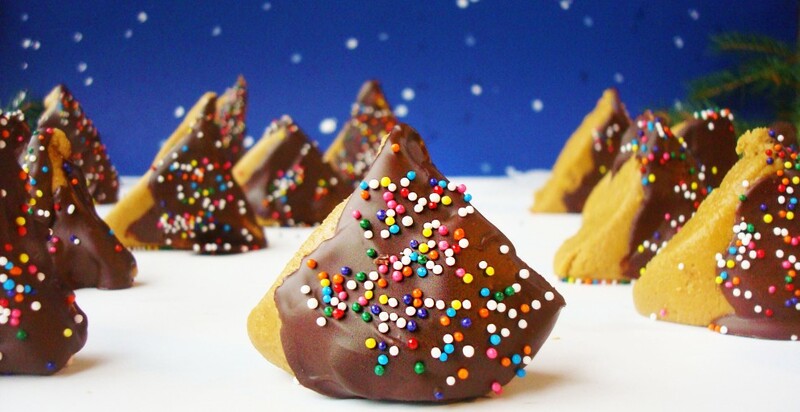 Peanut butter with chocolate is enchanting in almost any form, but particularly if said form is a Christmas tree! They are wonderfully easy to make. Ground up cereal, melted PB, and coconut oil come together to make this nice pliable dough to form the trees with. Then just a dip in melted chocolate and you’re good to go. Since they include ingredients almost everyone enjoys, they are a great choice to bring to your next Christmas party. I feel like they’re already a classic in our home, and I hope they’ll be a classic in yours too. Use a food processor to grind the Chex to a fine, sandy powder. Mix in the salt. Turn off heat, but do not remove peanut butter from heat source. Mix Chex powder, 1/4 cup at a time, into the peanut butter. Allow mixture to cool slightly and then shape into a ball. Place the ball on a pan, then tap the pan against a hard, flat surface several times to allow the ball to flatten into a disk that is approx. 1/3 inch thick, diameter 9—9 1/2 inches. Cool disk in fridge for 5-8 min. Cut different size triangles into the disk — 28-30 of them. Stand the triangles up. For the larger triangles, curl the two bottom edges back slightly. They will resemble a slight c-shape from above. This will allow them to stand up without falling. Place triangles in freezer for 30-35 minutes. Melt the chocolate. Holding the trees on one side, use a silicone spatula to "paint" the chocolate onto the front and back of the trees. The larger trees will need to be set in the chocolate while you're doing this. For a more kid-friendly method, melt the pb in the microwave and then put the pb bowl over a bowl of warm water while you mix in the cereal. So. I might just be in love with caramelizing bananas before using them in baking. It adds an extra layer of flavor and sweetness, subtle and toasty. And a little nutty. Even if you cover the banana flavor with other things (like with the Sour Cherry Scones), the toasty nuttiness remains. Heck yes, I’m tooting the banana horn here. I’m apparently 8 years old because saying banana horn makes me laugh. I didn’t use to like bananas, not in smoothies, not in cake, not in anything. But life doesn’t stay the same, and tastes don’t either. Did you ever think that you’d be obsessed with roasting cauliflower? I certainly didn’t, yet it’s rather popular. Probably because roast cauliflower is awesome, as long as you slice it thin enough. Wait, why am I talking about vegetables at a time like this? Y’all are here today for the caramel chocolate. These soft, gooey bars get their sweetness twice. Once from the caramel bananas, and then again from a generous pour of a vegan caramel sauce. They are very rich and sweet, which is why I like to cut them into smaller triangles instead of huge bars. They are more enjoyable that way…and um, you can always go back and get another or two or three. Or call up your favorite people and have them all over for an impromtu caramel party. That’s a thing, right? Grease a small skillet with 1 tsp coconut oil and place over medium heat. Slice the bananas into the skillet, as thinly as you can get them. Cook the bananas for 9-12 minutes, stirring occasionally (about once every minute or so), making sure they aren't burning or sticking to the pan. By the time you're done, they should be in an lumpy and mashed in appearance. Remove from heat. Grind up the cup of oats to a soft, silky flour. Combine the oat flour, the cornstarch, the baking powder, the cinnamon, and the baking soda. Set aside. Measure out the liquid from the coconut milk. There should be about 1/2 cup. If you don't have half a cup, fill up as much as you can with the coconut liquid and then add water or almond milk to compensate the rest of the way. Puree the bananas with the coconut liquid, the vanilla, the flax, and the brown sugar. Blend till smooth. Add the banana mixture to the oat mixture and stir well until combined. Add the 1/4 cup of chocolate chips to the batter. Spread the batter evenly into the baking dish. Sprinkle the 1/3 cup of chocolate chips over the batter. Sprinkle the 2 tsp oats over the batter. Measure out 1/2 cup of the coconut milk solids. There should still be some solids left over, which you won't use for this recipe. If still in a very solid state, warm up in the microwave for a few seconds until it becomes liquid and pourable. Combine the 1/2 cup brown sugar with the coconut milkfat. Stir until an even color and consistency is reached. Pour the brown sugar mixture over the batter. Allow to cool before cutting into small triangles. Enjoy with a cool glass of almond milk. * In order to get the coconut milkfat and liquid to separate, leave a can in the fridge for a few hours or overnight. You can also put in the freezer for a shorter amount of time. Be careful not to shake the can. When sufficiently chilled, you should be able to scoop the milkfat right off the top. not just any ol’ tagalong. PUMPKIN SPICE TAGALONGS. I love this classic Girl Scout cookie, but I always thought they’d be hard to make. I’m so glad I proved myself wrong. You only need eight ingredients, and you probably have most of them in your cupboards already. I’d rolled out of bed early on a Sunday, cookies on the brain. I stirred and baked and dipped, and by the time that Jas woke up, he had some sugar waiting for him in the kitchen. He smelled the cookies baking and thought I’d made pancakes. He wasn’t disappointed at not-pancakes. It’s hard to be disappointed with chocolate and peanut butter and spice. Grind the oats into a fine, silky flour. I used my Nutribullet to do this. Set aside. Combine the pumpkin, brown sugar, cinnamon, and pumpkin spice. Mix well. Add the oat flour to the pumpkin mix. You can start out with your spoon, and once it starts balling up, use your hands. Roll into a ball and cover the bowl with plastic wrap. Set the bowl in the fridge for 1-2 hours. Once your dough is firmed up, roll it out to about 1/4 inch thickness. Using a 2-inch diameter cookie cutter, cut out all your cookies. Place on a greased cookie sheet. You can crowd them as much as you want because they won't spread. Bake 15-17 minutes. Halfway through baking, pierce each cookie with a fork to let the steam out. They cook funny otherwise. Melt the PB for about 20 seconds in the microwave, just enough to soften. This will allow you to mix the salt in easier, and also allow for easier spreading. Spread a heaping teaspoonful of PB over each cookie. I found a butter knife worked best to do this. Set the cookies in the freezer for about 15 minutes. This will prevent the PB from melting into the chocolate during dipping. Once the PB is really hard, remove from the freezer`. Melt or temper your chocolate. Using your thumb and index finger as tongs, carefully dip each cookie, PB side down, into the chocolate. You don't have to coat the underside of the cookie (the part with no PB). If your chocolate starts to harden, give it a quick stir or return it to the heat. You probably won't need to do this, because the dipping goes quite fast. Set aside to allow the chocolate to harden. Or don't. They taste just fine all melty. P.S. If you use vegan chocolate chips, these can be free of all animal products. My mother and BGE’s mom and dad all came down for the weekend. Mamabear’s dog, Holly, came too. We had some wedding things to take care of, but it was also mom’s birthday so of course I baked her a cake. It’s made with amaranth, which means it’s gluten free…but let’s not go calling it healthy because it has lots of chocolate and coconut oil and brown sugar and all those things that make a cake taste good. This cake….this cake. I don’t know where to begin. Let’s start off with the texture. It’s super thick, almost like a solid ganache. It’s deep and dark and not too sweet, with an almondy finish. Don’t even attempt a slice without having a chilled glass of milk ready. It’s so solidly chocolate that you only need a small piece to be satisfied. That didn’t stop my mom (who is less 4’10” and weighs nothing) from sneaking into the kitchen and slicing off more and more of the cake. She kept making noise about how guilty she was about having too much cake, but we told her it was her birthday so she better enjoy every bite. If you look close at that picture, you’ll notice that the hearts form a triangle, but there is a heart or two is out of place. That’s totally okay. Everybody’s mother has a screw loose and that’s what makes them our moms. That’s part of what gives us our loose screws too. Chop up the chocolate into little pieces. Stir the coconut oil into the chocolate until it's melted. You can return it to the heat source to help it melt, but if you stir enough, it should melt on its own. Set aside. Beat the eggs and sugar together for about 2-4 minutes, until fluffy. Add the almond milk, flax, almond extract, and salt to the egg-sugar mix. Beat again. Add in the amaranth flour and cocoa powder. Beat on low until fully combined. Pour into a greased 9" pan or heart-shaped pan. Allow to cool and dust with powder sugar. 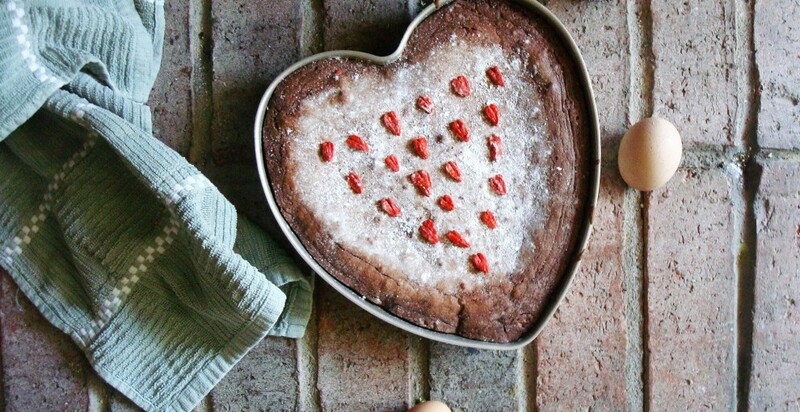 To make the goji berry hearts, pick out the largest berries. Flatten them with the side of a knife. Using a small pair of scissors or a small knife, make a split in the top part (rounder part) of the berry. Round out a little more if desired. And that's it! p.s. This isn’t sponsored content, but I would like to mention something nice that nuts.com did recently. I order from them often and last time I ordered, they sent me these goji berries for free. It was really nice of them – thank you!